Lately I have been overly caught up with reading news articles and Facebook posts about the recent election. Unfortunately I have seen a lot of meanness. It is sometimes hard to share opinions respectfully and kindly and I think most adults (and kids) need to work harder to learn how to be kind, even when they disagree with someone. All of the negative news has really put me in a grumpy mood, so we are kicking off the new week with some amazing process art shared by Art Bar Blog and a little kindness project. I can't wait! Process art is free flowing and open ended and is the perfect thing to do when you need to escape and take a break. If you haven't tried process art yet, scroll down for a few more details about it and why it is awesome. Recently Barbara (Bar) Rucci sent me a copy of her new book, Art Workshop for Children. Bar is the talented creator of Art Bar Blog and is a graphic designer, art teacher, and mom of 3. I am IN LOVE with all of the things she shares on Instagram and her blog, so when the opportunity arose to see even more of her creative ideas through her book, I jumped at the chance! The book arrived a few weeks ago and the kids and I have been poring over it. I have added sticky notes to the pages to select my favorite ideas and the kids have too. I've also had several moments where one of Bar's ideas has given me some inspiration for other projects I want to try! 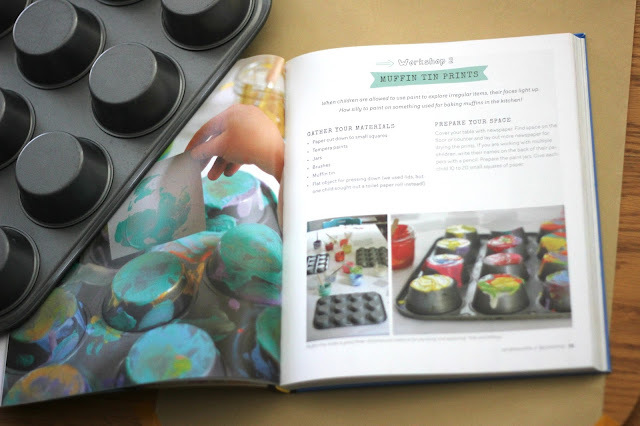 Today I'm going to share our FAVORITE activity from the book---> muffin tin print art! 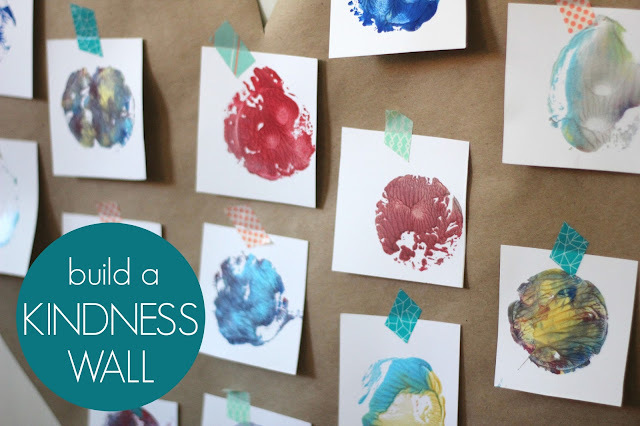 We also used our muffin tin art to make a kindness wall, so I'll share how we did that as well! The reason I love the ideas in Bar's book is because they are simple and easy to pull together and set up. To get started with this activity I just got out paintbrushes, paint, rolls of paper, and muffin tins! The kids painted the backside of the muffin tins and then they grabbed pieces of paper and pressed them down on top of the painted muffin tins to make prints! The prints were GORGEOUS, as were the crazy creations the kids made on each of the muffin tins. I loved how each one was different. My son used little mini bundt cake tins instead of a muffin tin, because I only have one muffin tin. There was a little more texture on the mini bundt pans so the prints turned out completely different. They were bumpy to paint on so my son loved it. After painting and pressing paper onto the muffin tins, the kids decided to use their muffin tins and make large prints onto the big pieces of paper I had laid out. It was neat to see how the different tins made unique prints. 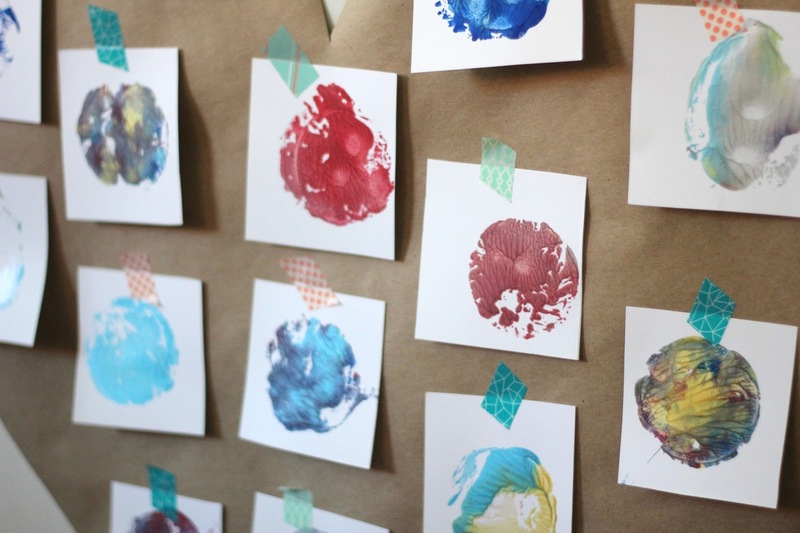 My kids had fun dragging the tins across the paper to make all sorts of lines and other types of prints as well. The kids painted, then printed, then painted again. I left out the activity for awhile and the kids would paint and print for awhile, then go off and play, then come back and want to paint & print again. Once the little colorful pieces of paper were dry, we decided to use them to make a kindness wall. We all need reminders to be more kind. From now until Thanksgiving as we think about what we are grateful for and who does kind things for us, we are going to start recording acts of kindness that we do and see. We grabbed some brown paper and made a giant heart to stick on the wall. Then we stuck all of the little painted pieces of paper onto the heart using washi tape. Just seeing our gorgeous heart hanging on the wall reminds me to show love and be kind. Over the next two weeks whenever the kids see an active of kindness (or do one themselves), I am going to have them come tell me and we will write it on the back of one of our muffin tin printed papers. After two weeks, we will pull all of the papers off the heart and sit around and read all of the kind acts that we did and saw. I am hoping that as the kids are hunting for acts of kindness to record, that they will be inspired to BE more kind and do kind acts for their siblings, neighbors, or friends. Each year we spend time in the winter doing a 100 Acts of Kindness Challenge, but lately I feel like we need reminders to be kind ALL OF THE TIME. I can't wait to get started with our little kindness wall! In addition to muffin tin print art, Art Workshop for Children by Bar Rucci is filled with over 25 other creative process centered art activities. Process art is amazing because it allows for unique outcomes. It is also choice-driven and child-directed. Although I love activities that are sometimes product-centered, process art is much more calming and fun because there is no right or wrong way and there are no specific outcomes in mind. In Art Workshop for Children by Barbara Rucci, Bar shares a lot of great info about process art. She also gives tips regarding how to set up an art space, what materials to gather, and how to create invitations to create. Each chapter of her book is filled with several exciting activities along with simple tips and ideas to think about, like talking to kids about their art or how to raise creative thinkers. The book is so useful AND powerful because it is such a great educational resource for parents/teachers while offering simple explorations for kids. 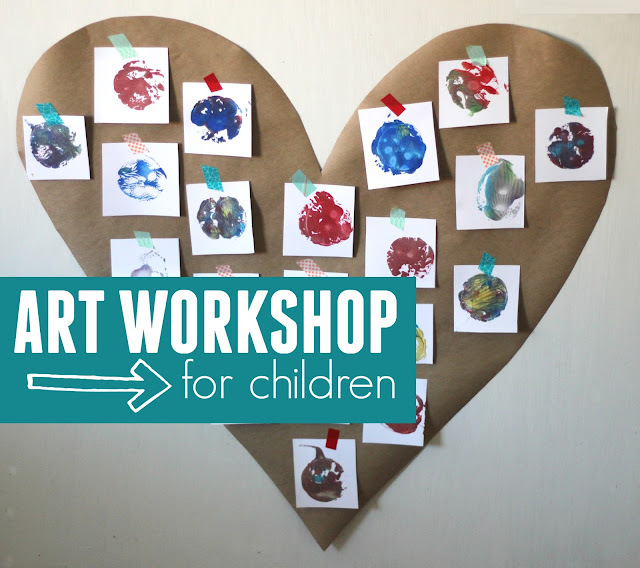 If you are interested in purchasing a copy of Bar's book Art Workshop for Children, go HERE. This activity ^^ is just ONE of many activities shared in Bar's new book. You can see more about Bar's book, her book tour, and what she's up to by following her over on The Art Bar Blog or Art Bar on Instagram. 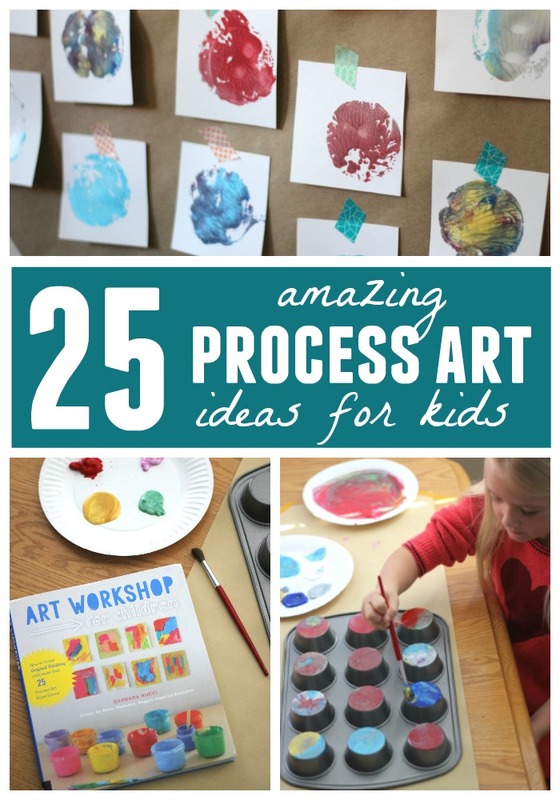 Have you ever tried process art before? 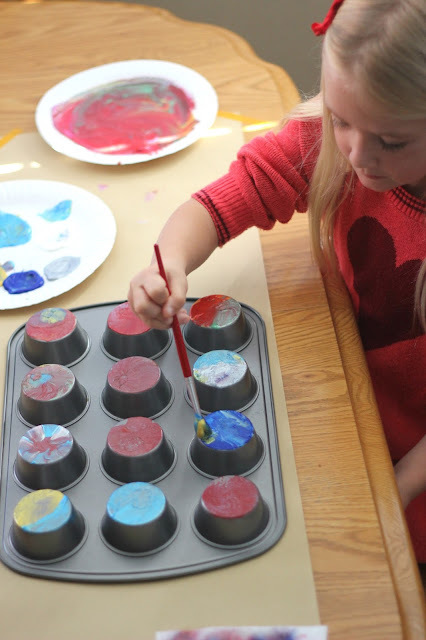 Have you ever painted on (or with) muffin tins? Tell me about your favorite process art experience! 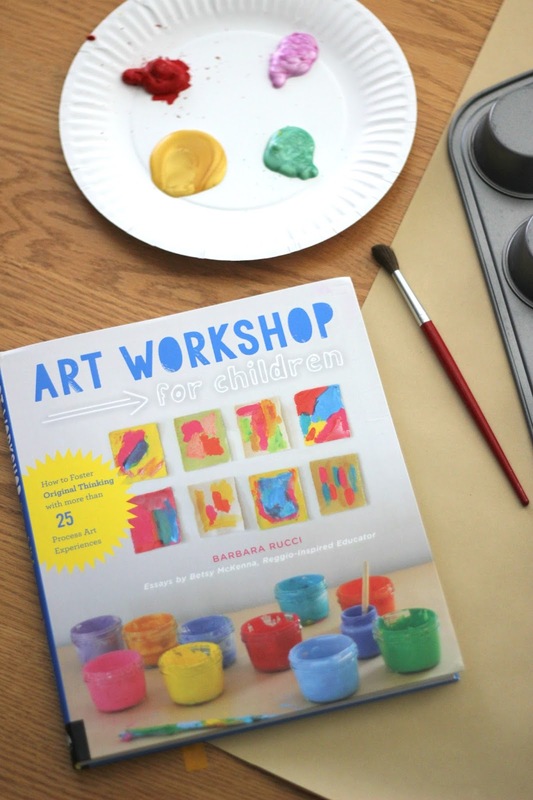 Disclosure: I received a free copy of Art Workshop for Children by Barbara Rucci to review for this post. All opinions are mine.